What Recession? Our Minimum Move Higher Has Been Met. Dow Jones Technicals and Market Update. Good Thursday morning all. Bit of a quiet morning so far. Morgan Stanley (MS) reported earnings and it was a big miss, with the shares down 5% as I write. But folks, have you seen what the financials have done this week? Big, 8–10% moves higher, post earnings reports from Citi and Goldman Sachs (the vampire squid) with regional banks seeming to beat estimates across the board. Again, we simply are seeing no real signs of a recession. But out of respect to the bears, I’ll add this; no one on the planet knows exactly what will happen next. Stocks “are” a leading indicator of economic growth, so we must pay attention to what the markets are telling us. But the markets aren’t a perfect indicator of recessions either, which we’ve seen time and again as bear markets occur “without” a recession taking place. This is why I created the VRA Investing System. It’s steered us right for many years. The VRA System told us that something very wrong was taking place in early 2007. 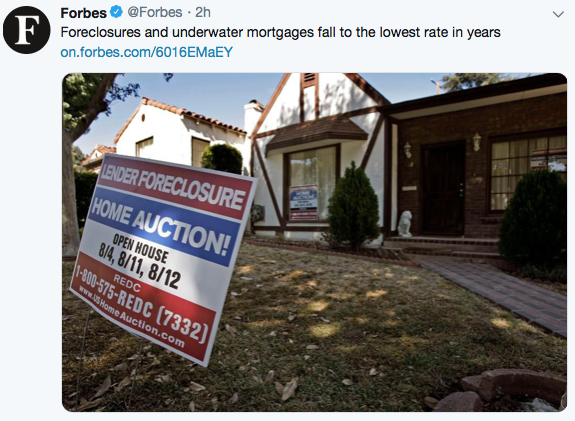 I must have written 100 updates that went like this “with the FED hiking rates 17 straight times from 2004–2006, and with mortgage co’s closing their doors left and right, real estate is sending us warning signs”. And then again, as the markets bottomed in March, 2009, the VRA System had us aggressively buying. Those March 2009 lows, which we called within 5 minutes (documented), proved to be THE lows. Today, the VRA System sits at 8/12 screens bullish. Our biggest concerns are the FED (don’t fight the FED) and the fact that our indexes remain well below their 200 dma (day moving averages). Otherwise, the fundamentals in the US remain solid. Mixed bag, for sure…which is why we cannot allow ourselves to be lulled to sleep. But I’ll repeat…December was an aberration. A capitulation of importance. That remains our view. Today, on the back of earnings misses and a short term, overbought market, we’ll get a good sense of what this market wants to do. If we can overcome this mornings DJ -100 futures, on the heels of some not so great news, and if the market can continue to climb a wall of worry and find a way to move higher still, there is no better market “tell”. As always, we’ll be watching the internals closely. Yesterday brought us another day of across the board positive readings. $3 trillion in money market funds on the sidelines, plus a return of share buybacks and M&A activity, tell us that a whole lot of bears are likely on the wrong side of this market. In late December we began pointing to our minimum move higher, which we placed at 24,200. We hit this level exactly yesterday. 24,200 was a 50% retrace from the early October highs to the 12/24 Christmas Eve massacre lows. Let's take a look at the chart of the DJ and see what might happen next. Again, we have now reached extreme overbought on some momentum oscillators (stochastics and money flow) while relative strength still has a ways to go. But let’s also remember that markets/stocks that reach overbought and remain overbought (without falling) are the single biggest bullish sign that we’ll ever see. And check out that selling climax volume in December. That big red line of volume we see was the single biggest sell side volume in history. Forever is a long time. Selling climaxes also mark significant turning points in the market (which also matches the many reversal indicators we’ve talked about often…sentiment, internals, analytics). If the markets can find a way to move higher, in the face of the items laid out above, then it's telling us much higher prices are on the way. That's just what I believe we’ll see. - 86% are beating bottom line estimates, with EPS growth of 27.4%. Folks, these are excellent numbers. If there’s a recession on the way, shouldn’t earnings start reflecting it by now? And check out this graph of S&P 500 revenue growth, in particular, the surge following the election. 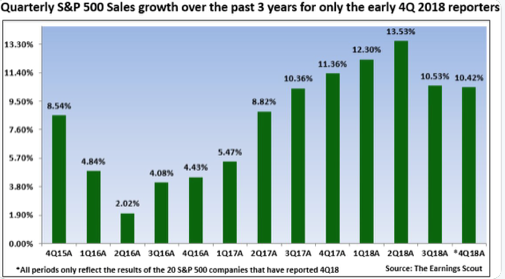 Consistent growth of 10%+, with EPS growth consistently above 15–20%. Again, no signs of recession. And yes, who the president is matters a great deal. Bears are insistent that Trump’s tax reform was a 1 year 1 off. That tax cuts were merely a sugar high. My view? They are not just wrong…they are dead wrong. We expect EPS growth of 10–15%+ in 2019 with revenue growth of 8–10%+. Again, no recession. Great question Will. My view of penny stocks has been that most are like roach motels. It’s easy to get in…not so easy to get out. So yes, the risks are real. And yes, the VRA is very aggressive in recommending these. However, if you read yesterdays update you may have noticed that my top picks of all time….Ultra Petroleum, JB Oxford, Dynegy and Ivanhoe Mines…were all sub $1 penny stocks when I recommended them. Evaluating risk is what we do. Factually, the price of a stock rarely matters to me. As long as the company has great potential, with solid management and little to no debt, then it does not matter to me what the current price is. This describes each of our growth stocks/story stocks, today. None have any debt to speak of, with each having heavily invested management teams with a track record of success. We want a CEO that is a proven winner. A proven founder/builder of co’s. And, one that is invested heavily in the success of his own company (not just there for his 7 figure salary, like so many CEOs today). And, as we’ve seen from “blue chips” like Enron, Worldcom, PG&E and GE, the risks in $50–100/share blue chip stocks are every bit as real. I’ll repeat, I would rather own VRA growth stocks…across the board….than most blue chips today. I have a hard time getting the CEO of most blue chips on the phone, but I can pick up the phone and call the CEO’s of small cap co’s with relative ease. I like this fact. And the obvious…we’re here to crush Mr Market. We’re here to make 50–100% + gains, as regularly as possible. It’s simply not possible to do this in the vast majority of blue chips. This market wants to go higher. The VRA Portfolio now has an average gain of 30% per position from those 12/24 lows. And we’re just getting started. Since 2014 the VRA Portfolio has net profits of more than 2300% and we have beaten the S&P 500 in 15/16 years. Experience the Vertical Research Advisory free for 2 weeks!! For a limited time we are offering a 2 week free trial to the Vertical Research Advisory, visit vrainsider.com for more details. December Was a Stock Market Aberration. VRA System Market Internals Flashing Buy Signals. Housing is Solid, Housing Stocks are Cheap. Good Thursday morning all. Our broad market recovery move higher continued yesterday as FOMC minutes were released that showed Chairman J Powell and Fed Governors explicitly “meant to say” that their December rate hike came with dovish expectations going forward (aka, rate hikes are off the table for a while). But folks, thats not at all how the markets treated Powells comments in December, as air pocket selling and a perfect storm of negativity resulted in the worst December since the onset of the Great Depression. For those that track seasonal patterns in markets (like us), it also pointed US indexes in the right direction. Asian markets followed our cue from last week with solid 4–5% moves higher. 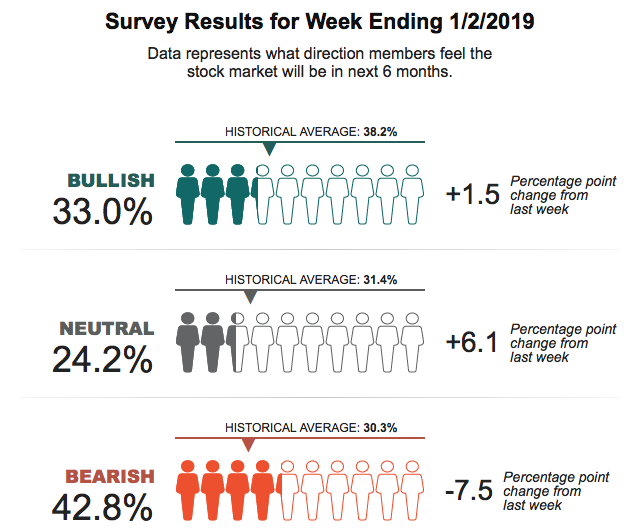 Not only is January typically a strong month for stocks, known as the “January effect”, where investors buy cheap stocks after tax-loss selling in December, but historical data suggest this month is poised to be even better than normal. That’s because it comes in the third year of the presidential election cycle, which is typically the best for equities. In pre-election years since 1950, the S&P 500 index has delivered its best returns in January, posting an average gain of 3.9% for the month, according to our friends at the Stock Trader’s Almanac. Part of the reason: Incumbents typically implement new policies ahead of a presidential election in an effort to boost the U.S. economy and make re-election more likely. One factor that could boost stocks is a thawing in trade tensions between the U.S. and China. Tuesday, Wilbur Ross (Commerce Secretary) was on CNBC and made the point that we’ve made here for more than a year; this is not a trade war…it’s not even about tariffs…this is about China’s rampant IP theft. Ross also stated “these talks WILL result in a resolution into the 3/1 deadline”. Signs of a strong U.S. labor market and dovish commentary from Federal Reserve Chairman Jerome Powell on Friday helped alleviate some economic concerns and powered our 3% + rally in the DJ on Friday. The FED has been the biggest enemy to investors of late, but this looks to be moderating. Big plus. Ed Clissold, chief U.S. strategist at Ned Davis Research Group, said he is advising clients to buy industrial stocks and other cyclical sectors such as energy, an area that typically performs well in the latter stages of economic expansions. “The market doesn’t need a trade resolution to rally, but it certainly would be a big help,” Mr. Clissold said. And let’s not forget my favorite piece of analytics; since 1946, in the year following mid-term elections, the S&P 500 has been higher 18/18 times with an average gain of 15%. And this piece of remarkable research from LPL. 24 of the 25 biggest gains for S&P 500 have taken place when SPX is “below” its 200 dma. That’s where we reside today…now the battle is on to recoup the 200 dma for our broad market indexes. As we start trading today, SPX is 6% below its 200 dma. Our view continues to be that December was an aberration. Now take a look at our market internals from yesterday. Better than 2–1 readings in both advance/decline and up/down volume. Importantly, yesterday marked the first ‘back to back to back” positive readings in the internals since 10/1. This looks to be an important pattern change. We first saw the internals begin to break down in early October…we covered it often here…the readings became brutal and selling pressure followed. Today, we want to see a continuation of another new pattern; “buy the dip”, with the knowledge that this mornings DJ futures are -123 on the backs of weakness in retail. We’ve come a long way in a short period of time…some form of cooling off period and smallish retest should not surprise. But I’ll repeat…the lows are in place…buy the dip is the strategy we will continue to employ. A great find by bull markets.co. 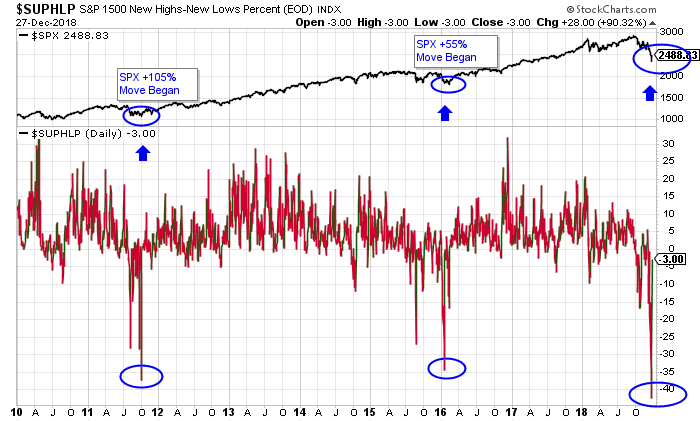 The percentage of stocks above their 200 dma have risen from below 11% to more than 27%, inside of one month, has occurred just 2 times. In both cases, the S&P 500 was sharply higher over the next 3–6–9 &12 months with 1 year gains of 16% and 39%. And check out this chart of Hong Kong (Hang Seng Index). We now have a higher low with a break above the first downtrend line. China’s markets began to display positive relative strength to US markets in October ’19. When China’s markets get hot, they can get white hot, quick. Yesterday we saw two home builders (Lennar and KB Home) report disappointing earnings…but that’s not what I was watching…I was watching the reaction in their share prices. Both LEN and KBH finished up more than 8% on the day. Remember, its not the news that matters…its the markets reaction to that news. 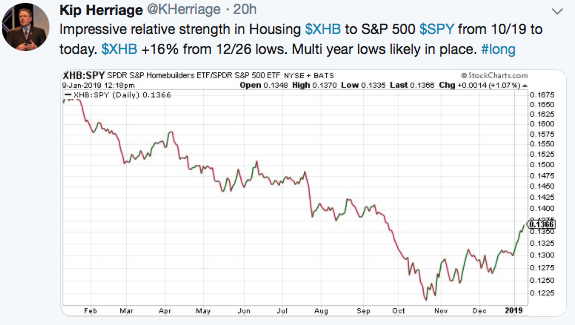 XHB (Housing ETF) began to display positive relative strength to the S&P 500 (from 10/19 on) and is up 16% from the 12/24 Christmas eve massacre. Continue to buy housing on weakness. The lows in housing are in place. Good Thursday morning all. Hitting as many quick hitters as possible this morning. 1) One of my investing icons has always been Peter Lynch, of Fidelity Magellan fame and author of one of the best investment books you’ll ever read (One Up on Wall Street). Lynch averaged 28% returns for his Fidelity fund. We’re talking about 2 decades of outperformance. Best fund manager we’ve ever seen. This was the approach that made sense for Lynch. Its also how I’ve been able to book gains of 500–1000% + over the years in our favorite growth stocks/story stocks. 2019 will be the year that small caps reverse their losses from 2018. “Important VRA Market Note: today may be an important trading day. Many of the biggest market rallies are initially signified by lower opens (like todays -400 DJ) that then get reversed completely, with the market moving higher for the rest of the day. We have panic-like levels of fear in this market. A wall of worry that should give us short covering fuel for the fire. Combined with large levels of bullish fund flow as we start the new year (pensions, retirement funds, share buybacks and insider buying), its important that we see a solid recovery, marked by improving VRA System Market Internals. The markets responded just as we had hoped, with a nice rally off of -400 in the Dow Jones and an across the board move higher in each broad market index. More importantly, here are the internals. Better than 2–1 positives in advance/decline and up/down volume. Talk about a pattern change from the last 2.5 months. MOST important for the VRA Investing System (which sits at 8/12 Bullish Screens today). This is exactly what we want to see going forward. This morning, with Apple (-9% this AM) slashing earnings guidance for the first time in 15 years, we see DJ futures -300 as I write. Today, we’ll get another opportunity to judge this markets “tell”. Once again, I expect our markets to move higher throughout the day. When “bad news” stops knocking the markets lower, there is no more bullish market tell…period. 3) Heres the latest AAII Survey. Sentiment remains at “extreme fear” levels, with just 33% bulls and 42.8% bears. 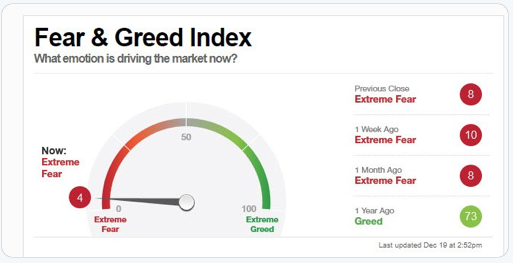 And the CNN Fear and Greed Index sits at 12. Again, extreme fear. We are contrarians, most certainly when it comes to extreme sentiment readings on either side. 4) CHINA — Another Japan?? I’ve written often about the parallels of China today versus Japan of the 80’s and 90’s. At the time, the world believed that Japan was in the process of overtaking the US (economically and even culturally) with parents teaching their children Japanese and Wharton Business School (among many others) teaching Japanese management practices to a young US audience. At the time, Japan was buying up US properties left and right, including dramatic overpayments on many (including buying the Pebble Beach Golf Course at 5x its present value). But then the US got serious about Japan…as did the rest of the world. Japan quickly found themselves overextended and the tide began to turn. 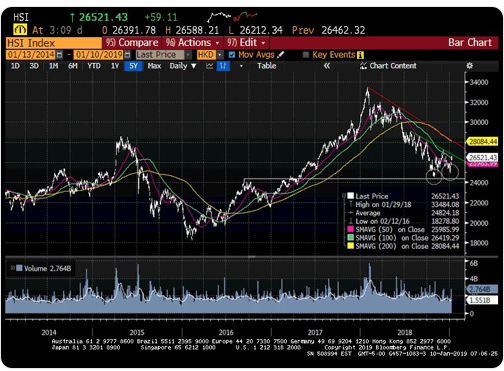 What followed was a 75% drop in the Nikkei Dow and a 19 year bear market in Japanese real estate. A brutal lost two decades for Japan. Trump’s actions with respect to China were never designed to be a “trade war”, but unless China wakes up to the worlds demands that they learn to complete honestly on the worlds economic stage, this mornings news that China’s economy is contracting could soon become an ongoing albatross for China’s economic future. With debt/GDP of 270% today, can China afford to make this kind of colossal mistake? I look for China to have a good 2018. I believe they know their history and do not want a repeat of Japan’s two lost decades. China’s markets were the worst performing of all major markets in 2018. This will reverse in 2019. Since 2014 the VRA Portfolio has net profits of more than 2300% and we have beaten the S&P 500 in 14/15 years. The 1987 Stock Market Comparison to Today. Significant Lows Are in Place. Good Friday morning all. I’ll repeat…December ’18 will be viewed as an aberration. A perfect storm of stock market negativity…90% of it structural/political…that marked significant long term lows. And we have some hard evidence to back it up. 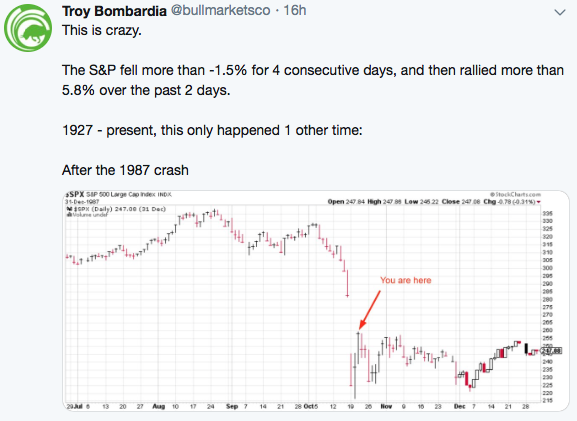 First, I’ve been referring to this correction/bear market as the 2.5 month version of the 1 day 1987 crash. I lived and worked through the ’87 Black Monday and those that sold their positions on Monday would go on to forever view that as the single biggest mistake of their investment careers. I watched as seasoned, 20–30–40 year stockbroker veterans, entered “market orders” at mid-day that Monday. Just doing whatever possible to get their clients OUT. What a mistake. What they had no way of knowing at the time was that the floor of the NYSE was so overwhelmed by sell orders that anything sold at market on Monday would not receive a final fill price (confirmation) until 3 days later…Thursday. I’ve never seen more depressed and absolutely bewildered men, as they learned that their market orders had been filled at the “exact lows” from Mondays 21% crash. By Thursday, when they got the awful news, the same positions that they sold…blue chip stocks all…had already recovered more than 1/2 of their losses. To make matters worse, by the end of 1987, the Dow Jones would actually close 2% higher on the year. Life-long careers were ended that week. Our firm was a morgue, for many months to come. Selling into a vacuum…like ’87 and like 12/18…is/was a mistake. Take a look at the following, from Troy Bombardier. Like ’87, the S&P 500 just fell more than 1.5% for 4 consecutive days…it then rose more than 5.8% over the next 2 days. From 1927 on, this has occurred just 2 times. 1987 and 12/18. And like ’87, multi-year lows are likely in place, today. This is the same chart that we’ve focused on since the Christmas eve capitulation, when the S&P 1500 reached its most oversold levels in the history of the S&P 1500 (1500 largest co’s in the US). As we wrote at the time, this is exactly what capitulation looks like…42% of all S&P 1500 stocks hit a 52 week low, this Christmas eve. But its what happened next that we want to key on; following the 2011 lows (37% at new 52 week lows), the S&P 500 began a move that would take it 105% higher. Then, following the 2016 lows (34% at new 52 week lows), the S&P 500 began a move that would take it 55% higher. Importantly, yesterdays trading gave us exactly what we wanted to see. A big, near 900 point move higher in the DJ (from -630 to +260), and it took place with new 52 week lows putting up MUCH better readings of just -3% on the day. This was and is my most important market internal. It looks very much to have marked the lows. 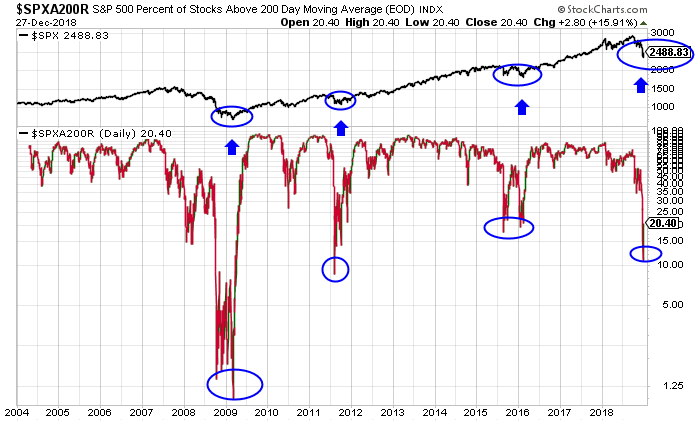 Now, take a look at the S&P 500 percentage of stocks below their 200 dma. On Christmas eve, we hit the 3rd lowest reading on record, with just 12% of S&P 500 trading above its 200 dma. History tells us that the previous 3 low readings also marked important capitulation in the stock market. By no means are we out of the woods. Should we retest and break the Christmas eve lows, then we have real trouble on our hands. I see the probability of this now as “extremely low”. The smart play is to continue to use dips. Buying the dip is the only move that makes smart money sense, based on my 33 years of doing this and the historical data that tells us this goose was way too overcooked. Like 1987, once the lows were in place, the gains that followed were superb. That’s our stock market, today. 1) December will be remembered as an aberration. A mistake, fed by hedge fund forced liquidations, computer driven sell programs, a hostile Federal Reserve and an air pocket of selling. The Dow now has a 24,300 magnet tied to it (minimum target). 50% retrace. Buy the dips. 2) Dramatic reversal higher yesterdat…from a technical point of view it confirmed Wednesday’s reversal and 1080 point move higher (big). Again, buy the dips. 3) The internals did just what we were looking for yesterday. New 52 week lows, in particular. 4) Best looking sectors for the deep value investor; housing, financials and emerging markets/China. Each is trading at “recessionary levels”. 5) and finally, should we ever see the Fear & Greed Index hit 2 again, sell all of our worldly possessions and buy index call options. 8/12 VRA System Screens remain bullish. Until next time, thanks again for reading….have a good weekend. VRA Update: Fed Rate Hike. J Powell Owns a Dubious Record. Fear and Panic. Blood in the Streets. Good Thursday morning all. As expected, J Powell’s Fed hiked rates to 2.5% yesterday. The DJ had hit an intraday high of +330 just moments earlier…then Powell started talking…. -500 DJ within 30 minutes, before closing -351. 1) Going forward, he pegged US GDP at 2% to 2.5% (‘19). It sounded very much as if that is his preferred target…not the 3% to 4% to 5% that Trump is targeting. Who needs more and better paying jobs? Who needs wage increases? Powell sounded very much like an ivory tower policy wonk that is out of touch with the reality of everyday Americans. 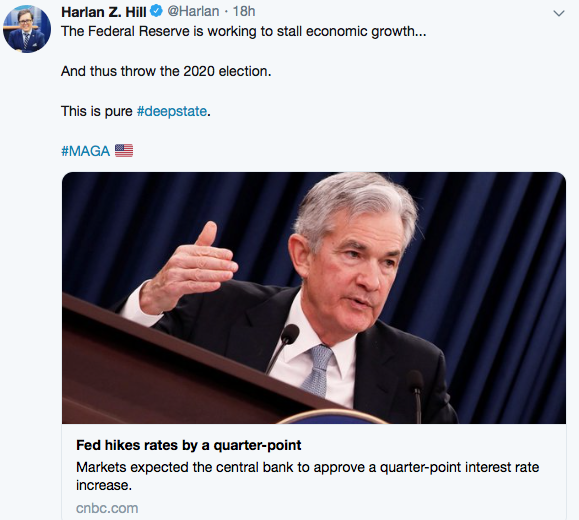 2) Powell made it clear that the Fed’s $50 billion/month runoff of Fed holdings will continue, apparently regardless of how the economy reacts. J Powell now has the unique distinction of having the equity markets sell off every time he gives an FOMC speech. Stocks have a well established pattern of moving higher during FOMC Fed Chair speeches…but Powell has sent the markets lower, each time. Having said this, Powell got a lot right too. The US economy IS strong. The Fed does need to continue to reduce its balance sheet, which reached $4.5 trillion under Obama. And Powell’s Fed did reduce expected rate hikes in 2019 to two, from three, while also mentioning that even those hikes would be data dependent. What’s the Wall Street/social media whisper conspiracy theory (it’s actually much more than a whisper)? This tweet sums it up pretty well. The deep state Fed, hard at work. Fear of the unknown takes over. The VRA Investing System sits at 8/12 Screens bullish. We stand by our call yesterday that a sharp move higher is coming. 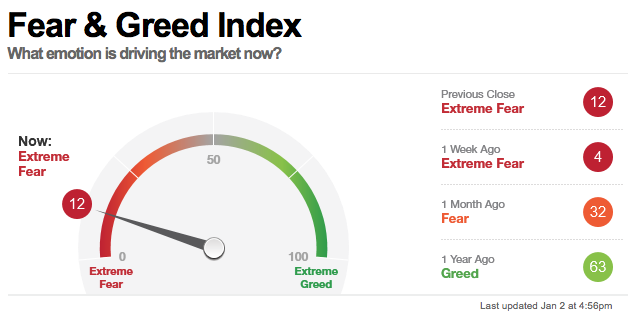 Late last night we got the latest from the Fear and Greed Index…a reading of 4. This is the lowest reading in history. All time lows. 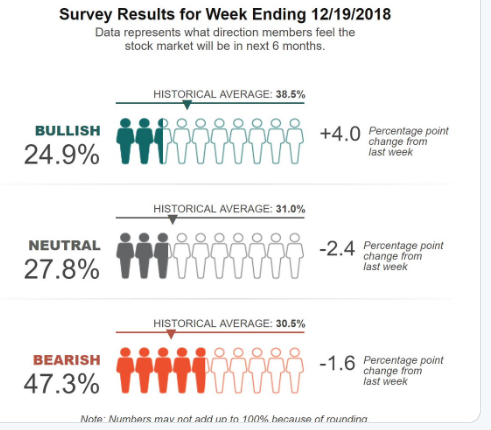 Combined with this weeks AAII Sentiment Survey readings (24.9% bulls and 47.3% bears), one thing we know for certain; investors are in full on panic mode. Blood in the streets, a fact that was confirmed last week by all time record weekly fund outflows of $46 billion. As you’ve seen us discuss this week, at minimum we are due for a counter move higher. A significant one. Thats exactly how I see this year wrapping up. The VRA Market Internals from this move higher will determine what happens next. Also, consider that the Russell 2000 is already down 25%. The S&P 500 is down 16%. 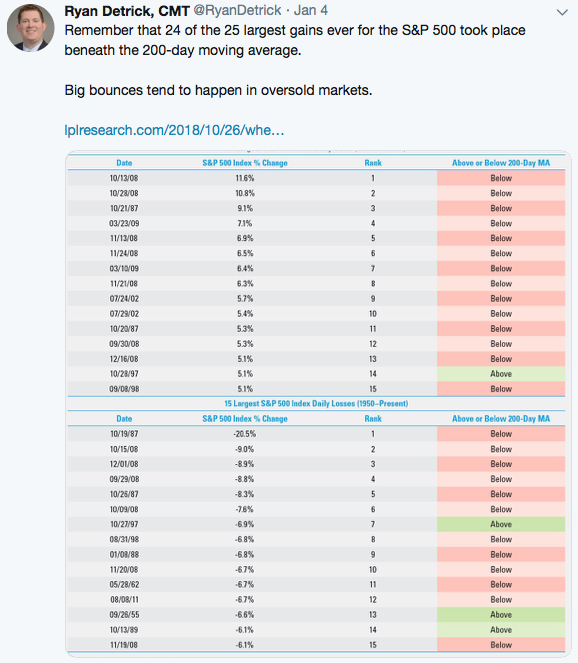 Bear markets are defined by 20% moves lower….we’re there folks…assuming it stops at 20%. Again, I see us as being there, today. And this; assuming we were to actually have a recession, according to Barrons banks stocks (on average) fall 31% (peak to trough) during a recession. As of yesterday, large cap banks/brokers are down 32%. Again, we’re there. And this tweet from Dave Bergstrom (another good follow) is most interesting. SPX futures closed at the bottom 30% of their daily range for the 5th straight day. This has happened just 3 other times. As you can see, following each of these, the markets have roared higher. Another solid example of “extreme fear”. And this from Bullmarkets.co. 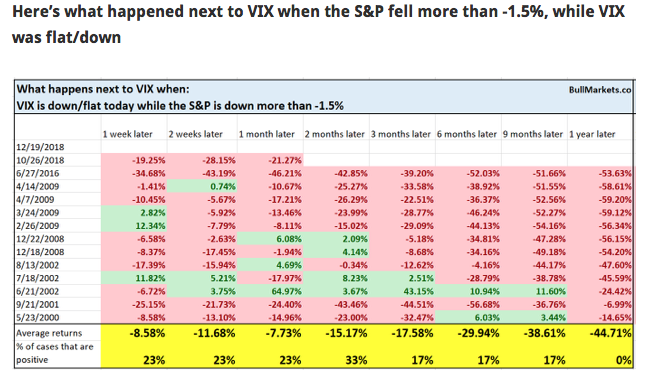 Yesterday the VIX actually fell, while the S&P 500 dropped 1.5%. Historically, this is a harbinger of sharp falls for the VIX (which is a major market positive), with the “average” decline in the VIX over the next year of 44%. And my tweet from last night. 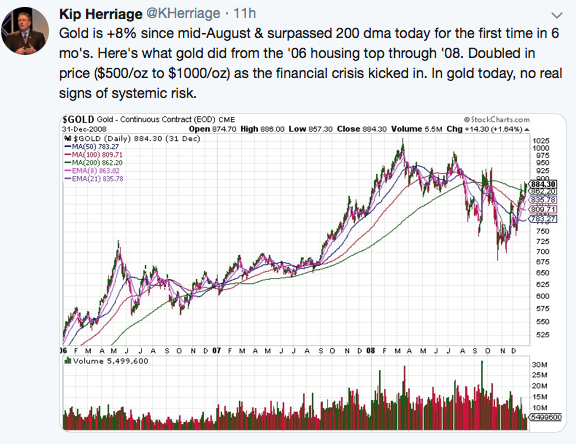 Below is the chart of gold from 2006–2008, just as the housing crisis was kicking off and financial panic was nearing. Gold did its job as a predictor of systemic issues to come, rising from $500/oz to $1000/oz, a 100% move higher. But today, gold has risen just 8% since August. Does not mean that it won’t spike higher from here, just that as of today, gold is not predicting a systemic issue is on the horizon. As a reminder from yesterdays update, all 4 broad market US indexes are now at “extreme oversold” levels. Again, time after time, we see panic occurring in sentiment and technicals. While at the same time, the US economy continues to expand, rather than decline. And here’s a positive to keep in mind. To date, for ’18, a record $800 billion in share buybacks has already occurred. But from corporate commitments, we know that another $300 billion remains left to be bought back, which will take the record number of buybacks to $1.1 trillion this year. I believe we are on the cusp of a 50% retracement from the current move lower. This would take the DJ back to roughly 25,000 (closed at 23.323 yesterday). In our next update we’ll get into VRA growth stocks…they are primed for great things in ‘19.